Here you may enter when a time-based synchronization should begin. You may either choose time intervals (first option) or define fixed times (second option). Time intervals are easier to handle. Simply select one of the predefined intervals. If the exact time is important to you, you must enter the times yourself. For this, activate the second option and click on "Add" to add new times. In this sub dialog, you may select or enter the time and may even select certain weekdays. 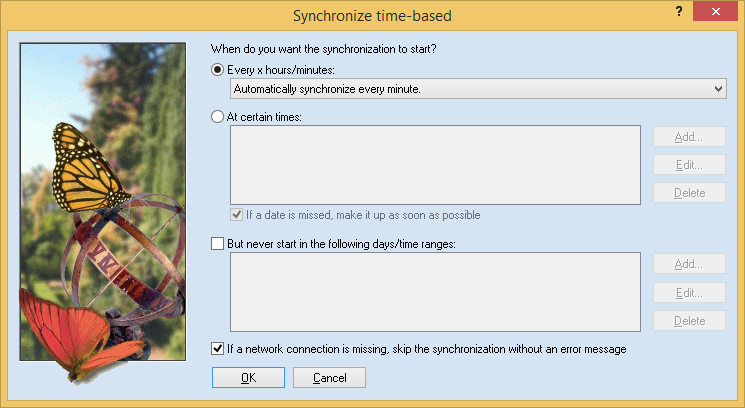 It can happen that a date cannot be met because another synchronization is running. With the checkbox "If a date…" you may Easy2Sync to make it up when the other synchronization has finished. Furthermore, you may enter times where a synchronization should never be started, for example because a network is down at night or because a backup process is running. The way you enter data in this part is similar to the times describes above. For the unsupervised usage of Easy2Sync, it can be useful to let Easy2Sync ignore network errors. Easy2Sync normally checks if all involved directories can be reached before the synchronization. If the checkbox "If a network…" is not activated, Easy2Sync will issue an error message.